Looking for gift cards in another region? We have regional sites for our European and Canadian customers. Choose plastic or digital gift cards from over 130 Canadian brands. With favorites like Starbucks, Loblaws, & Amazon.ca, your recipients are sure to love their gift card rewards. Power your rewards program with plastic or digital gift cards from European brands like ASK Italian, River Island, & iTunes UK—inspiring your recipients to participate and engage. The very first Lettuce Entertain You restaurant, R.J. Grunts still exudes the funky lifestyle of the ’70s in its style, décor, music and all-American menu. Happily for all of us, the best eating of that day continues to be some of the best today, with “the world’s first salad bar”, the best burgers in town and giant hand-scooped milkshakes (booze optional). Located in the heart of Lincoln Park, R.J. Grunts continues to be a favorite among families and Chicago natives. Please present this card for food, beverage, tax and gratuity at participating Lettuce Entertain You® Enterprises, Inc. restaurants up to balance. This card is not valid toward Frequent Diner points when used and is not accepted as payment for delivery orders. For private parties or catering events, this card may only be used toward final payments up to $1,000. Not redeemable for cash in any state, except where required by law. SAFEGUARD THIS CARD. 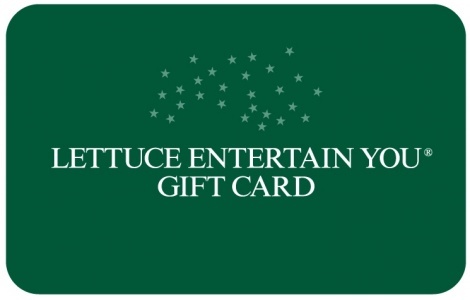 Lettuce Entertain You® Enterprises, Inc. is the issuer and sole obligor to card owner. Purchase, use or acceptance of card constitutes acceptance of these terms. Looking for Real Time eGift Cards? NGC's Gift Card API gives you access to more than 150 eGift cards in real time with a variety of delivery methods including direct-to-recipient fulfillment. Visa® is a registered trademark owned by Visa International Service Association.